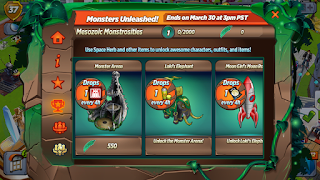 MARVEL AVENGERS ACADEMY: Monsters Unleashed Special Event is Live! 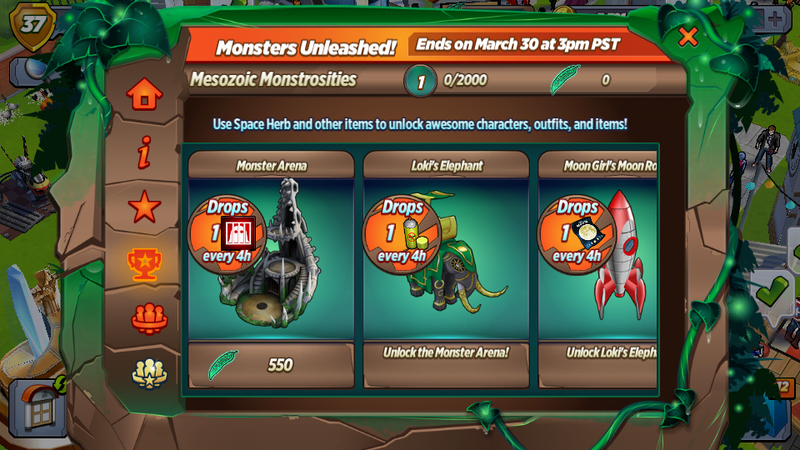 The Monsters Unleashed Special Event is now live in our games! 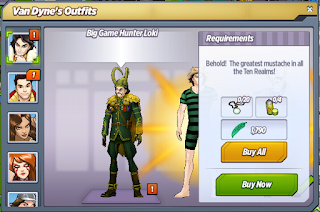 In order to participate, players must download the latest update, be at Academy Level 6, and have built Van Dyne's Outfits. 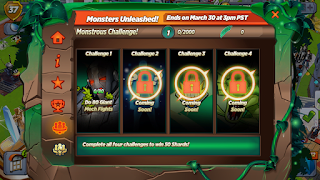 Begin the quest "Monsters Unleashed!" to start the event! 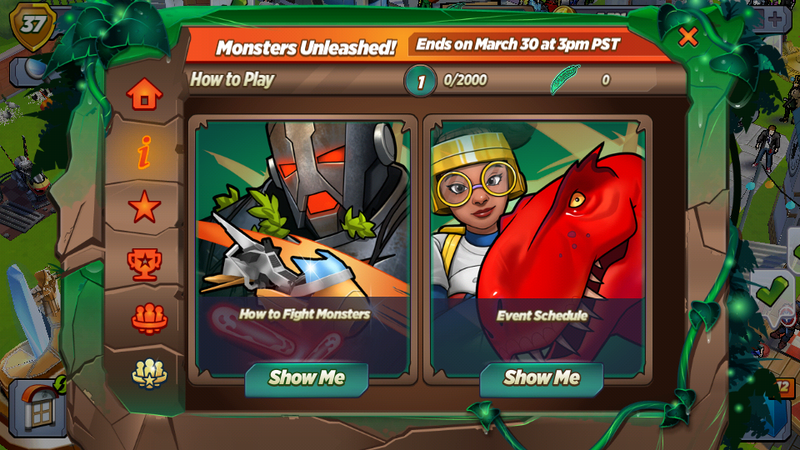 The Event will end on March 30th at 3 pm PST/6 pm EST. 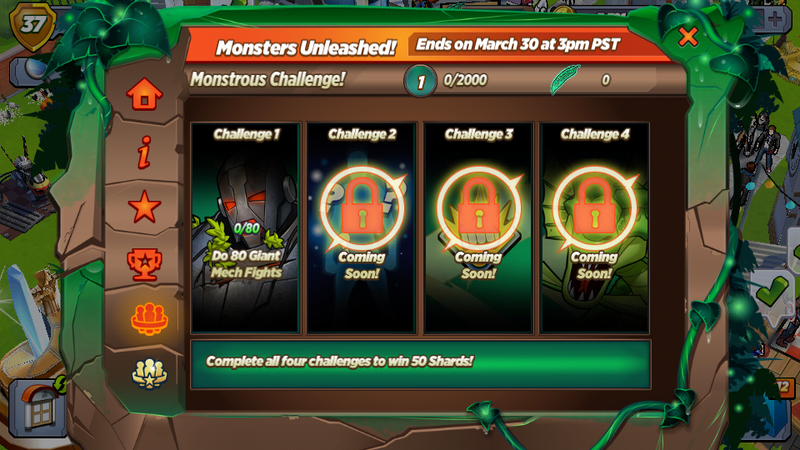 Episode 1 of the Monsters Unleashed Special Event ends on March 9th at 3 pm PST/6 pm EST. 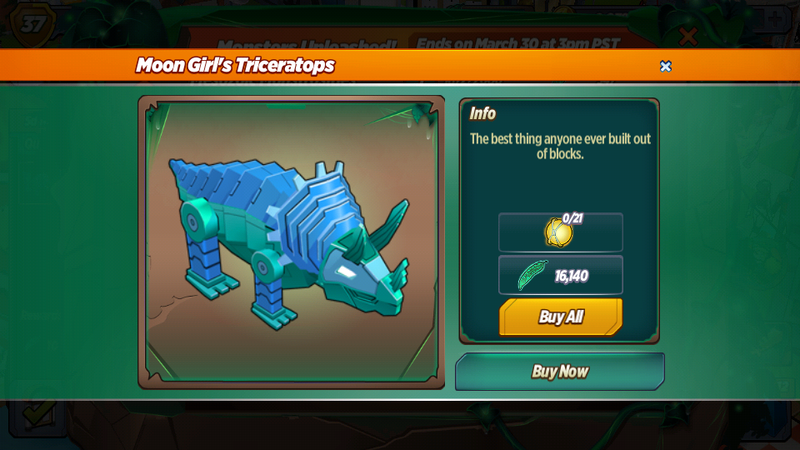 You must unlock Moon Girl's Triceratops by the end of the episode or it will no longer be available at that time. 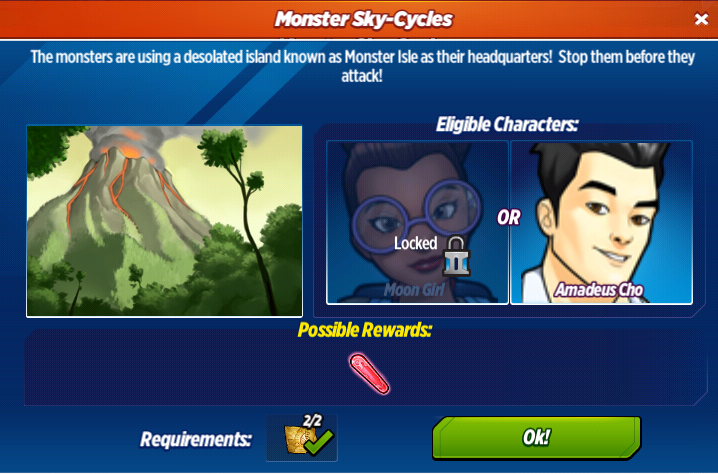 How do I recruit Moon Girl? 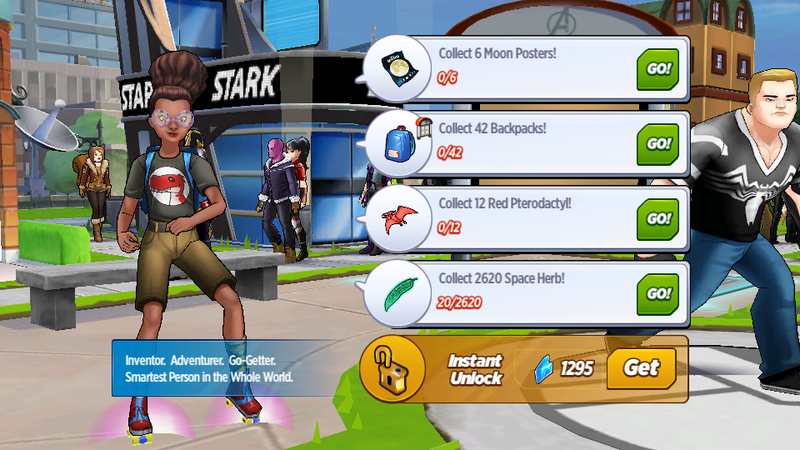 Once you turn in these items, Moon Girl will join the Academy. She must be completely unlocked by the end of the event or she will disappear from the game at that time. 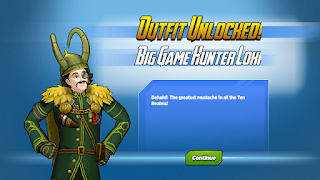 How do I unlock Big Game Hunter Loki? 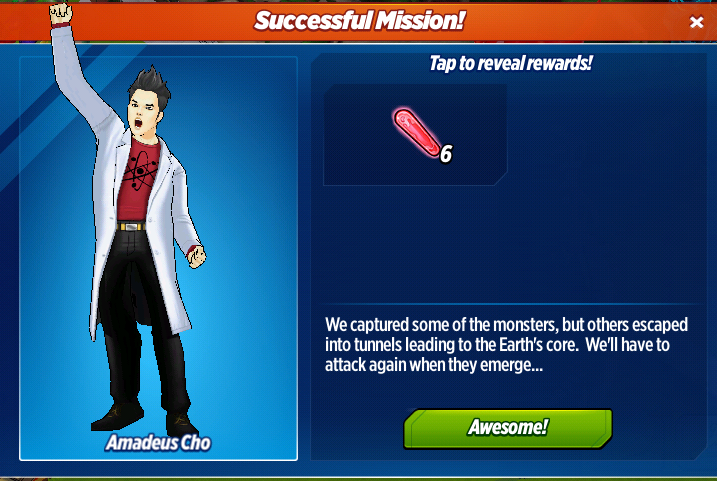 How do I unlock Amadeus Cho? 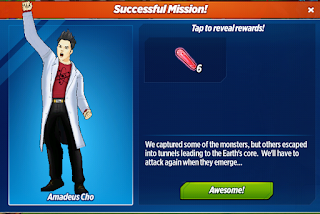 Amadeus Cho is available to recruit for 525 Shards! 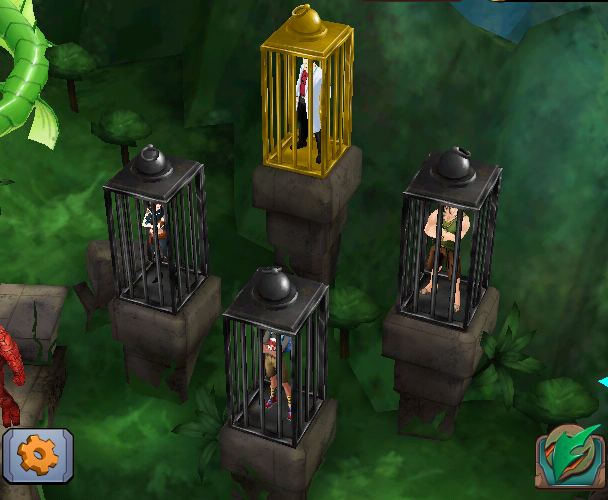 You can find him in the Gold cage in the event space. Amadeus Cho can battle bosses, go on Monster Cycle missions, and pilot the mech to fight Fin Fang Foom! 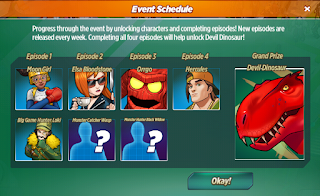 He must be completely unlocked by the end of the event or he will disappear from the game at that time. How do I access Monster Cycles? 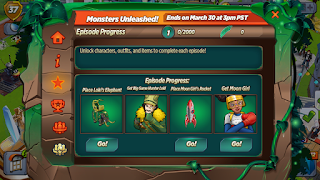 Start the quest "Go Monster Hunting!" to access Monster Cycles! 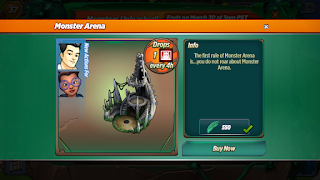 You will need Monster Maps from the Mission Board to ride them. 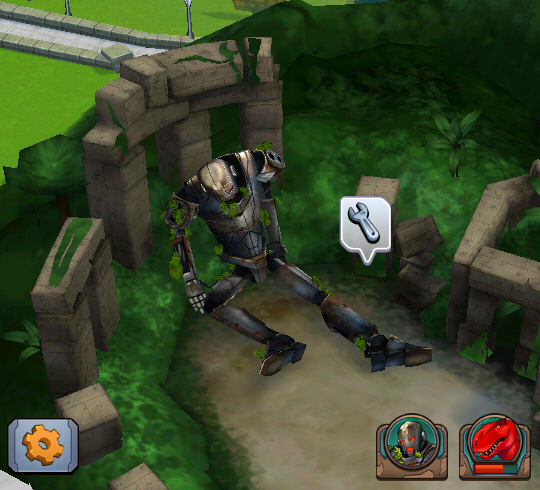 Riding Monster Cycles yields Phlogistone for Researching Jaeger Actions and piloting the Giant Mech. 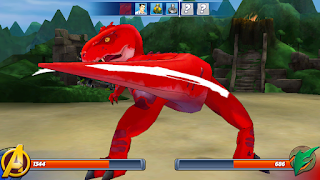 How do I fight Devil Dinosaur? 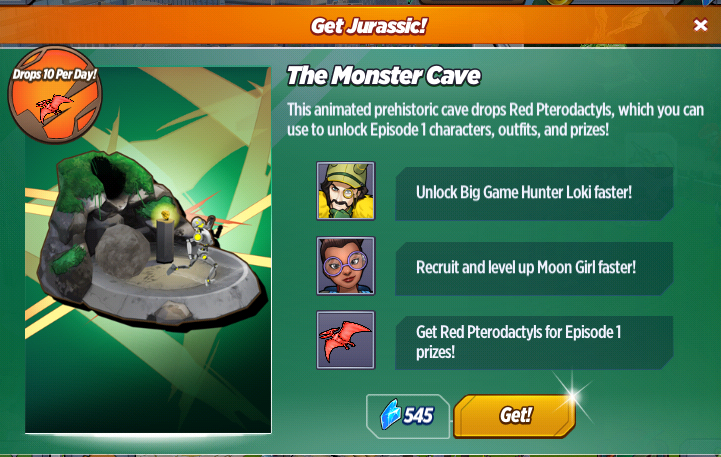 Start the quest "Defeat Devil Dinosaur!" to begin fighting Devil Dinosaur. 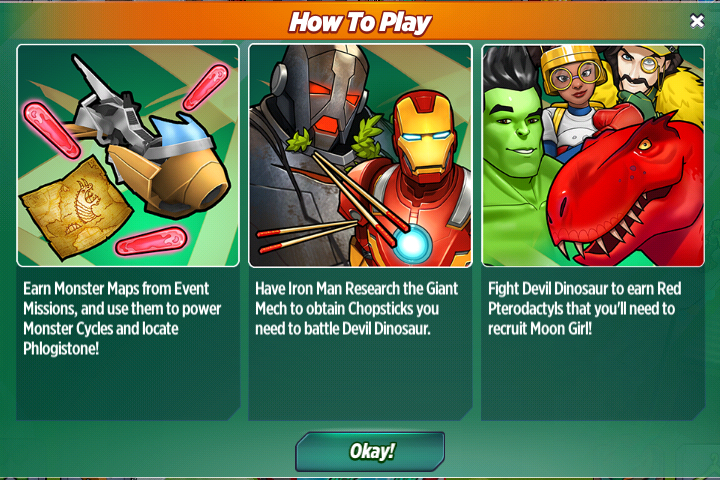 You will need Chopsticks from having Iron Man perform the "Research Giant Mech" action to fight him. 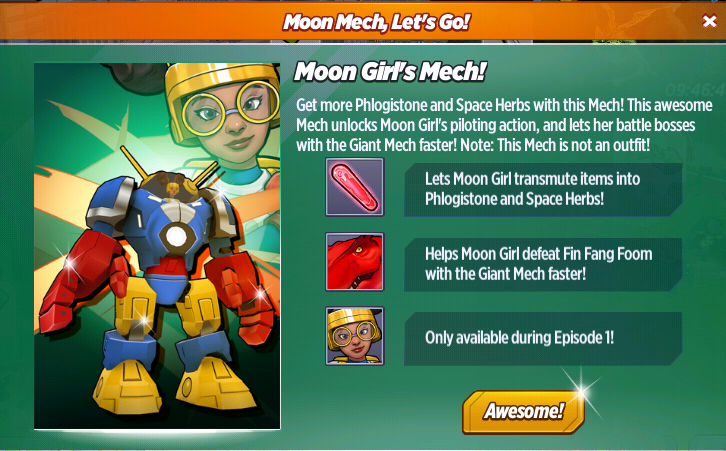 Once you have Amadeus Cho or Moon Girl, the action is replaced with piloting the Giant Mech. 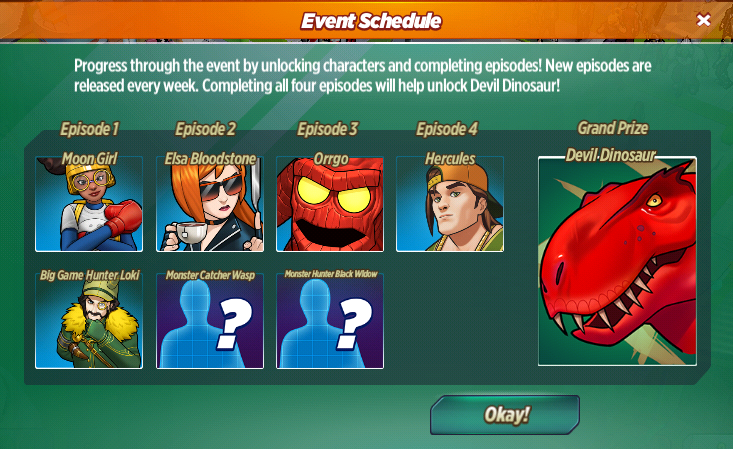 Moon Girl, Amadeus Cho, and Big Game Hunter Loki can fight Devil Dinosaur and Iron Man can join them once you unlock Loki's outfit! Defeating Devil Dinosaur grants you Space Herbs, Red Pterodactyls for recruiting Moon Girl, and Omni-Wave Projectors for unlocking Moon Girl's Triceratops. 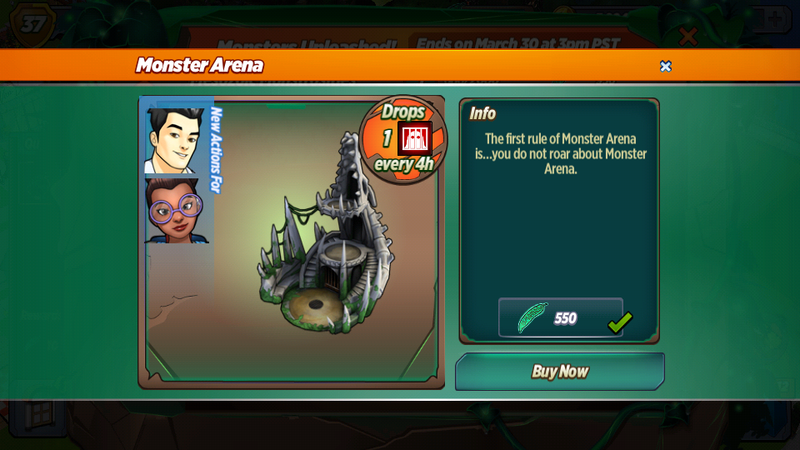 Access the Combat Skills Menu after building the Monster Arena to level up your characters' attack and health! 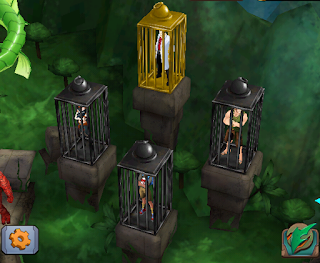 You will need Monster Cages from the Monster Arena to train your combat skills. For stat info click here. 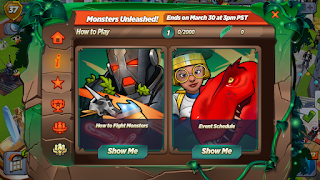 Start the quest "Giant Showdown!" to pilot the mech and fight Fin Fang Foom! 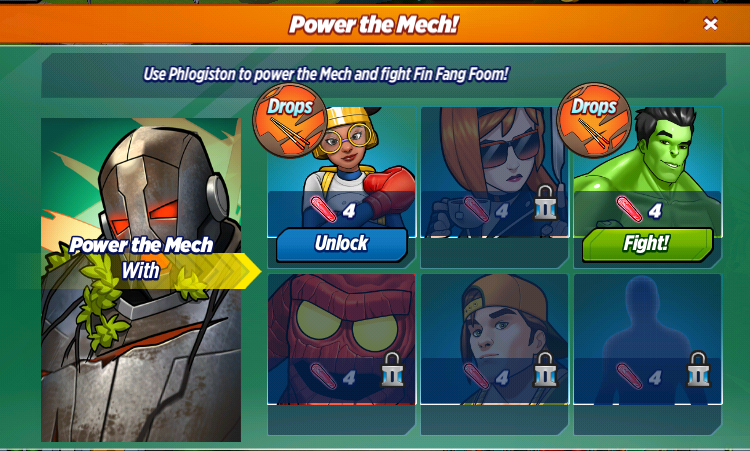 You will need Phlogistone from Monster Cycles to pilot the mech. 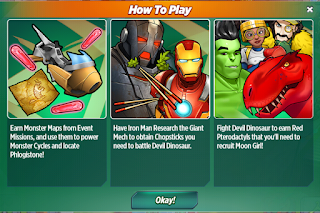 Fighting Fin Fang Foom grants Chopsticks to continue fighting Devil Dinosaur. 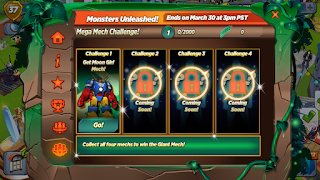 Gadgets will start dropping from the fight after you have unlocked Moon Gir's Moon Rocket to help you unlock Moon Girl's Mech. 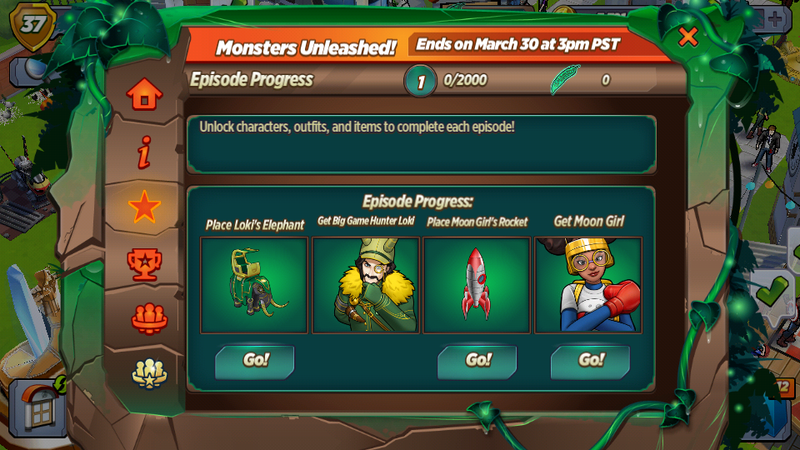 How do I get Moon Girl's Mech? 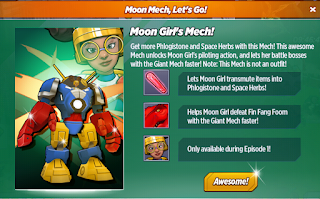 Moon Girl's Mech allows Moon Girl to transmute items into Phlogistone and Space Herbs and helps her defeat bosses with the Giant Mech faster. 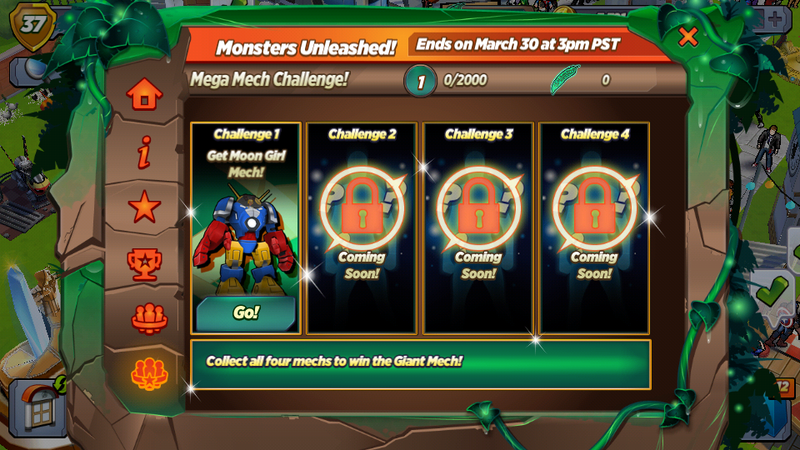 The Mech is only available for 7 days once you start the quest! Fin Fang Foom: What's wrong, tiny being? You act like you've never seen a gigantic Makluan shape-shifting space dragon from the world of Kakaranthara. Fin Fang Foom: Fin Fang Foom. He whose limbs shatter mountains, and whose back scrapes the sun. 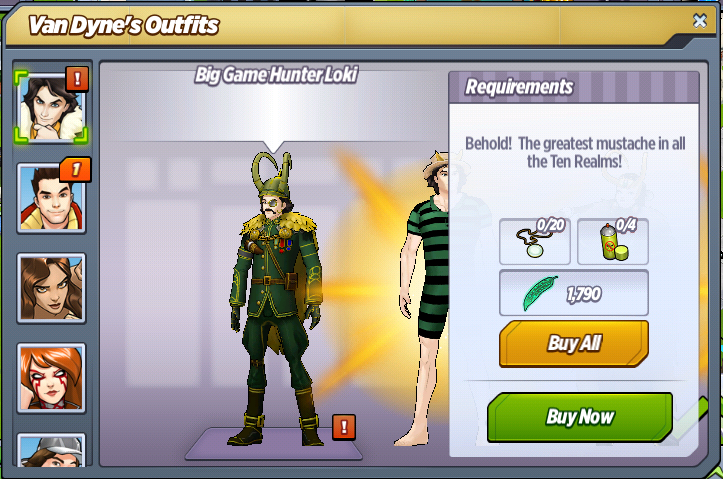 Loki: That...doesn't sound awesome at all. What do you want? Kang: Long time no see. I just wanted to drop in, and see how my revenge is going. Kang: And the timefog was supposed to keep Fin Fang Foom trapped in permanent hibernation. Oops. Nick Fury: How'd you set him free? Nick Fury: I'd love to make you eat that helmet. Nick Fury: We've been looking for you a long time, Moon Girl. Moon Girl: You think I don't know? It's hard enough hiding a dinosaur from the public. Even worse keeping him away from S.H.I.E.L.D. Nick Fury: How'd you do it? Moon Girl: I made my own dielectric metasurface cloak. It would've been better, but I only had sandwich bags and pencil lead. Nick Fury: You must be pretty smart. Moon Girl: I'm the smartest person in the whole world. It's not bragging if you can back it up. Moon Girl: I heard you're number three. Not that anyone's counting. Number three is really impressive. Iron Man: How old are you? Moon Girl: I keep mine in the packaging to maximize their long-term value. Moon Girl: Just because you're under Fin Fang Foom's telepathic control, doesn't mean you get to roar at me. Pepper Potts: Welcome to Avengers Academy, Moon Girl! We're so happy you're finally here! Is there anything special I can get for you? Moon Girl: Thanks! I'm mostly excited to have access to all of the Academy's tech and materials. Pepper Potts: Great! I'll be happy to answer your questions. Moon Girl: I'm really interested in metallurgical analysis of Vibranium. Mostly metallography, microhardness testing, and scanning electron microscopy. Do you have a scanning electron microscope for high resolution microstructural examination? Black Widow: How do we stop Fin Fang Foom? Nick Fury: Space Herb. It's a rare plant that puts him to sleep. Get enough of it, and it'll make him hibernate. It works best if you get him to eat it, but even having it in his general vicinity drains his energy. Black Widow: How do you know so much about this Space Herb? Fin Fang Foom: You think you can defeat the great Fin Fang Foom with zzzzzzzzzzzzzzzzzzzzzz. Black Widow: Did you just fall asleep with your eyes open halfway though that sentence? 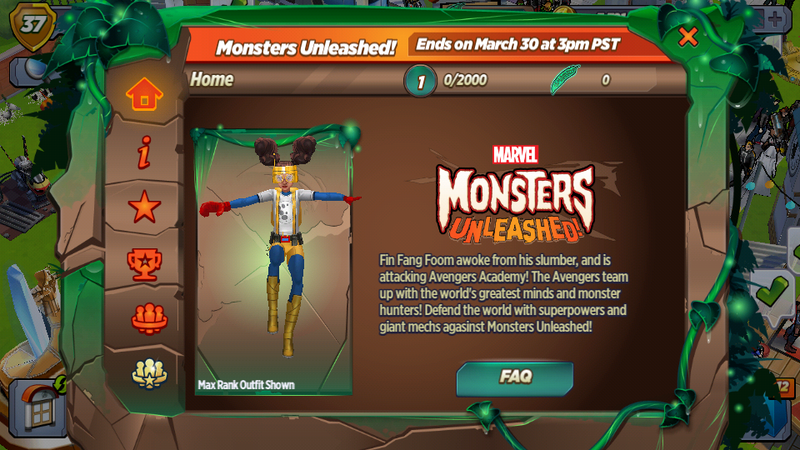 Fin Fang Foom: What?! Where am I?! Who took my purple shorts?! 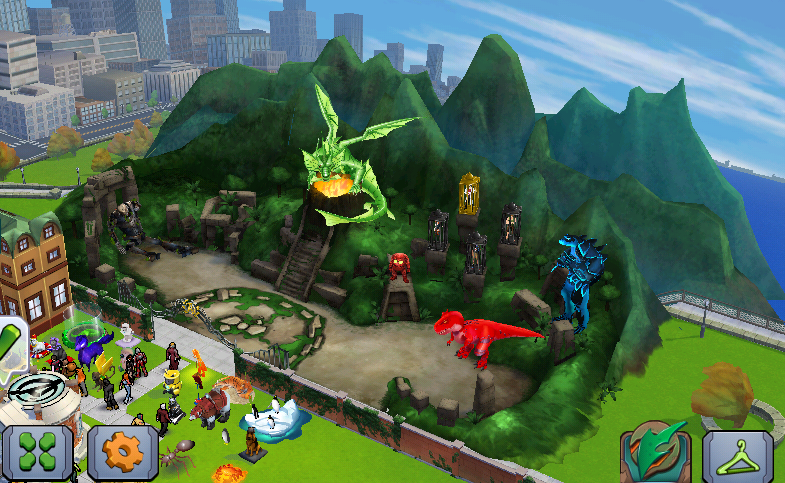 Nick Fury: We have enough people here to fight Devil Dinosaur and Fin Fang Foom. Monsters are running rampant all over the world. We have to hunt 'em down. Nick Fury: What's that supposed to mean? Black Widow: A dragon that you know more about than you're telling escapes from the timefog that you know more about than you're telling, and you wanna send us around the world on a wild monster chase. Nick Fury: Would you rather not fight the giant monsters, Black Widow? Black Widow: I wanna fight everyone. 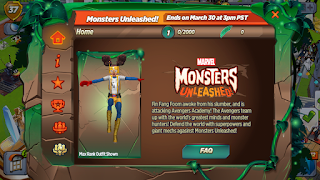 Fin Fang Foom: They're tracking down my army of monsters. I need more time to find my rings or power. 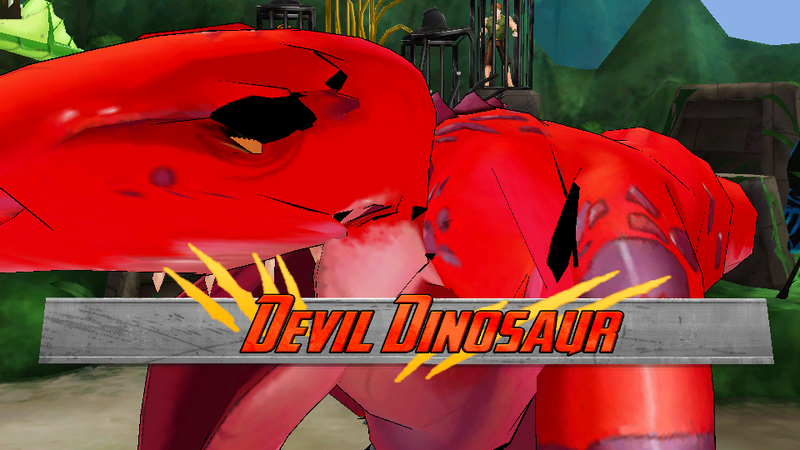 You have to stop them Devil Dinosaur. Fin Fang Foom: I keep forgetting you're a pea-brained dinosaur. Fin Fang Foom: Don't roar at me. It's rude. 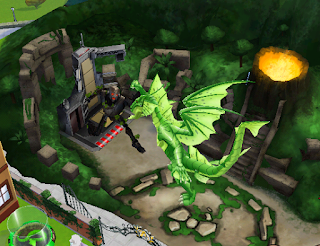 Iron Man: We found an ancient alien mech in the jungle surrounding Fin Fang Foom! Moon Girl: Is it a giant mech?! Iron Man: It's so giant! It's perfect for fighting giant monsters! Moon Girl: Awesome! My Moon Mech is super cool, but I don't think it's strong enough to beat Fin Fang Foom! Does the giant mech work?! Iron Man: It runs on an element called Phlogistone! It's a powerful source of renewable clean energy created from a reaction of the Moon's ore with different types of energies! Moon Girl: Then let's pilot this giant mech, and wreck Fin Fang Foom! Iron Man: I don't know how to turn it on! Moon Girl: What do you mean by "an entirely different universe." Hank Pym: It's just a figure of speech. Moon Girl: Don't be scared, Devil Dinosaur. 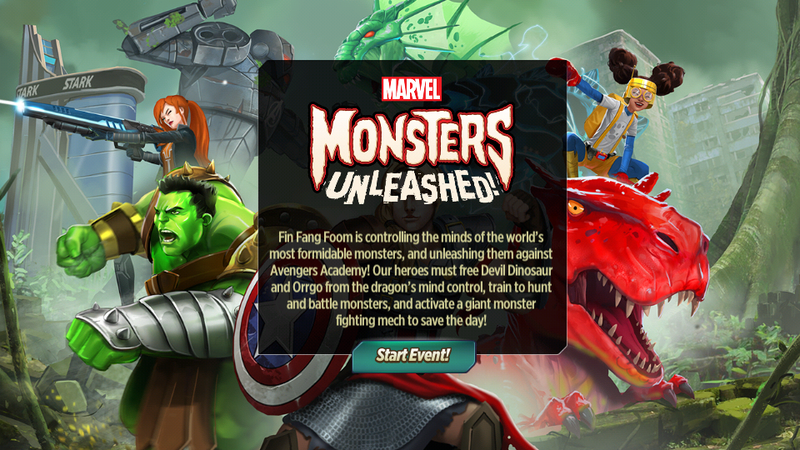 We have to fight you to break Fin Fang Foom's mind control. Note: For character stats & streak info, see here. Moon Girl: I'm sorry we have to hit you. This will all be over soon. Moon Girl: I'm just gonna stop talking to you until you're done being evil. 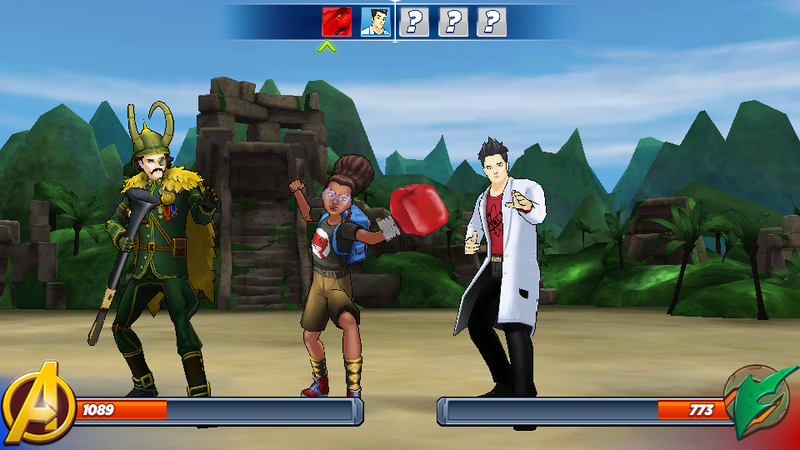 Black Widow: You need to train your skills to have any chance of beating Devil Dinosaur. 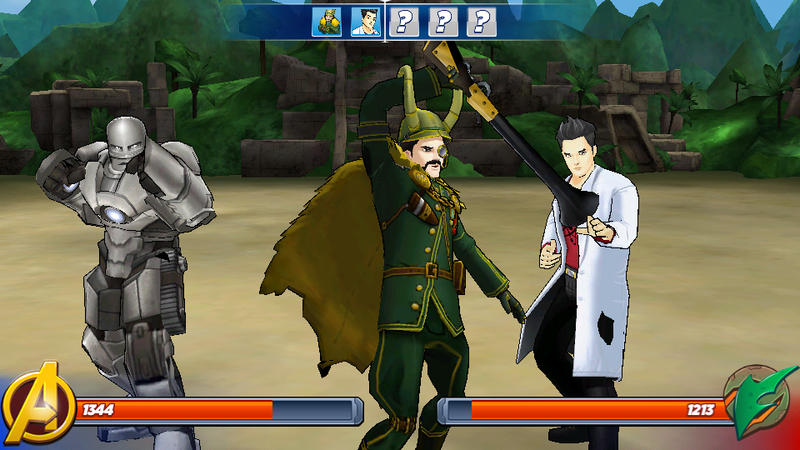 Loki: You need to train your skills! Black Widow: Right. I'm saying that everyone needs to train their skills. You don't have to be so sensitive. Loki: You don't have to be so sensitive! Black Widow: I hope the dinosaur eats you. Defeat Devil Dinosaur 3 Times! Fin Fang Foom: Perhaps there's a reason most of you went extinct. Wasp: I totally love dinosaurs! 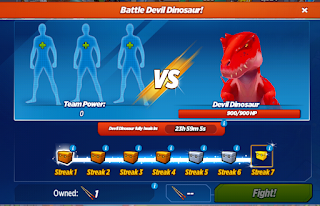 Defeat Devil Dinosaur 5 Times! Mephisto: I heard your name was Devil, so I figured we should meet. Mephisto: I know, I know. First, an evil alien dragon takes control of your mind, then your friends try to help you by beating your brains in. It's hard out here for a Devil Dinosaur. Mephisto: I can make it all better. We only need to make a deal. What do you want more than anything, Devil? Devil Dinosaur: Rroouuhll rowllrl roooorrlll? Moon Girl: Fin Fang Foom is controlling you with fear, but don't worry. I'll fight back with the power of friendship! 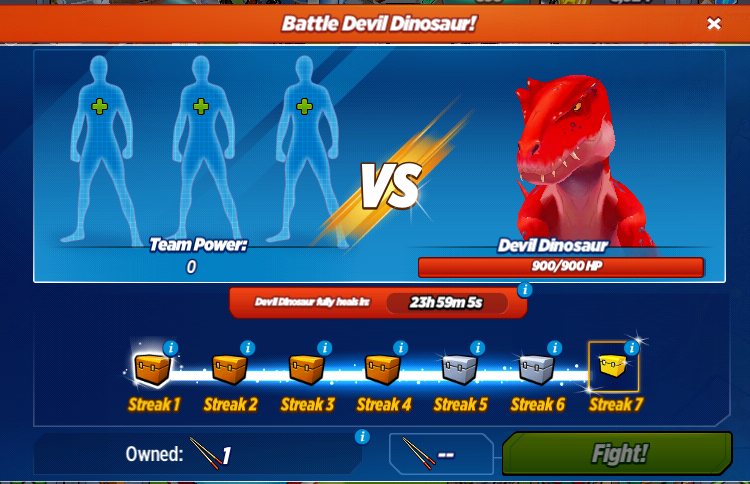 Defeat Devil Dinosaur 7 Times! 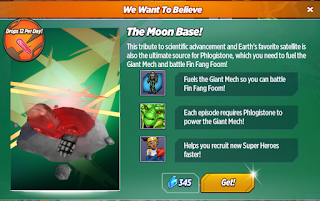 Moon Girl: We did it! You aren't under Fin Fang Foom's control anymore! Moon Girl: Where have I heard that noise? Did you swallow Wasp? Moon Girl: I figured out how to get the giant mech running! 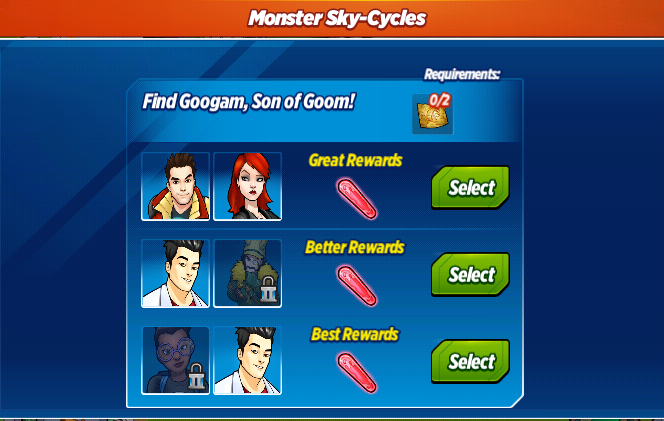 We can finally use it to fight Fin Fang Foom! Iron Man: Awesome! I'll try it out first to make sure it works! Moon Girl: No way! First one to the giant mech gets to fight an awesome giant monster in an awesome giant robot! Iron Man: No fair! I'm too excited to run good! 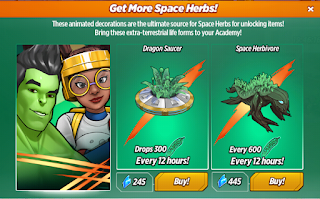 Fin Fang Foom: You think you can defeat Fin Fang Foom with Space Herb and a rusty robot? Those punches were softer than a Makluan massage. 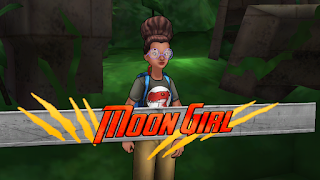 Moon Girl: Now that I now how to pilot the mech, I'm gonna keep making improvements until it's unstoppable. Fin Fang Foom: By then I'll have recovered my ten rings of power, and I'll be unstoppable. Fin Fang Foom: Fin Fang Foom has no time for the thesaurus! 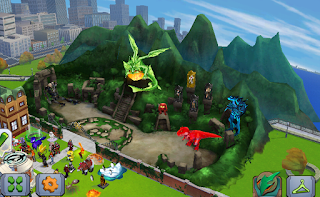 Odin: If you're going to be battling monsters, you'll need a proper place to train. Black Widow: Inside of a giant skull?! Black Widow: Is it weird that I'm so excited about fighting inside of a gigantic skull? Black Widow: That's fine. I'm pretty sure it's my turn to be the weird one. Black Widow: It's from Asgard. Sif: Verily. You can tell by the shape of the eye sockets. Gods, I want to stab a dragon in the eye so bad right now. Is that weird? Black Widow: It's the serious ladies' turn to be weird now. Big Game Hunter Loki: What do you know of Midgardian elephants? 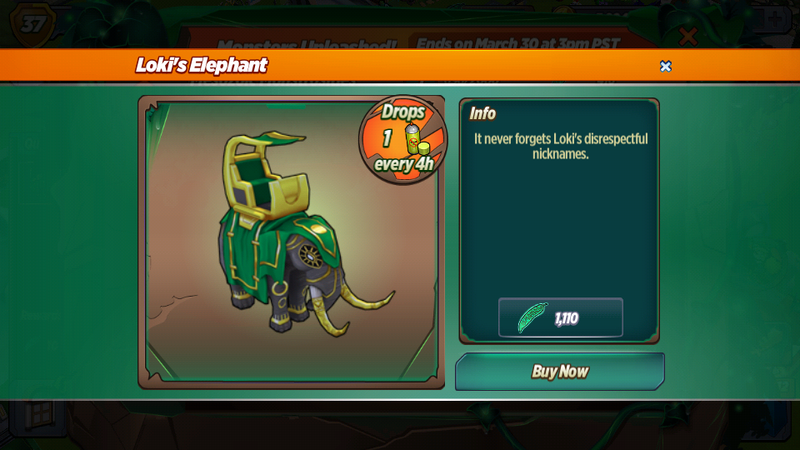 Big Game Hunter Loki: Would an elephant make a proper hunting mount? Wasp: Totally! Just watch out for mice. Elephants are super afraid of mice. And ghosts. Especially mice ghosts. Big Game Hunter Loki: Why do I ever ask you anything? Thor: What is this magnificent beast?! Big Game Hunter Loki: An elephant. Apparently, they love peanuts, but are terrified of spirit mice. Thor: Can I pick it up?! Big Game Hunter Loki: Why do you always feel compelled to pick up heavy things? Thor: To show off my godly thunder muscles! 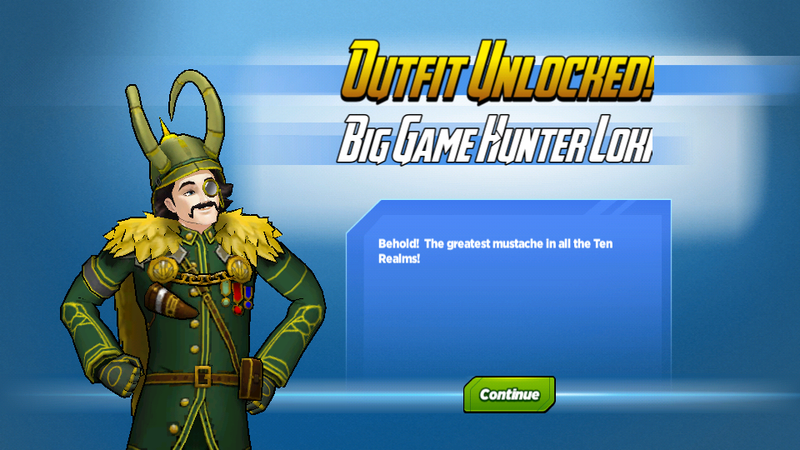 Big Game Hunter Loki: At least you're honest. Iron Man: Nice homemade moon rocket! 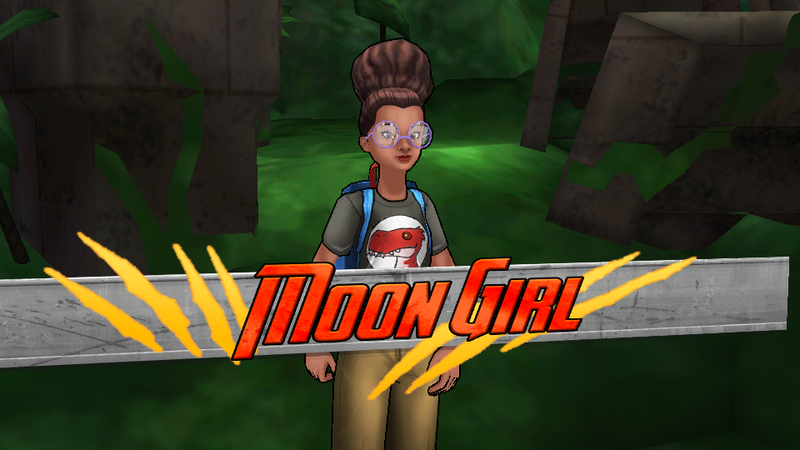 Moon Girl: Thanks! It's a long way from being spaceworthy, but I'll figure it out. Iron Man: You should paint your last name on the side in huge letters. 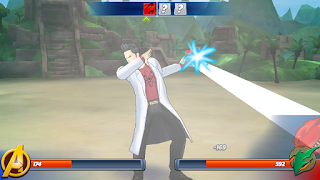 In the super-science business, we call that Starking it up. Moon Girl: What if I don't wanna Stark it up? Rocket Raccoon: What's that hunk o' crap? Moon Girl: Is that how you always talk to nine-year-old girls? Rocket Raccoon: It's how I always talk to everyone. I don't change my approach based on species, age, or gender. So, what is this crap? 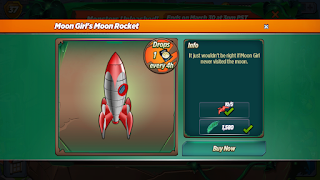 Moon Girl: A moon rocket. Rocket Raccoon: You seriously think this thing will make it to the moon? You're even dumber than my partner, and he's even dumb for a tree. 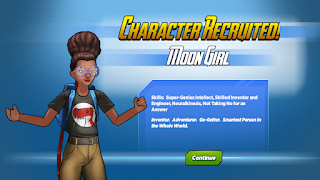 Moon Girl: You think you can do better? Rocket Raccoon: I've built ships better than this out of spit and paperclips. Fin Fang Foom: You made this? 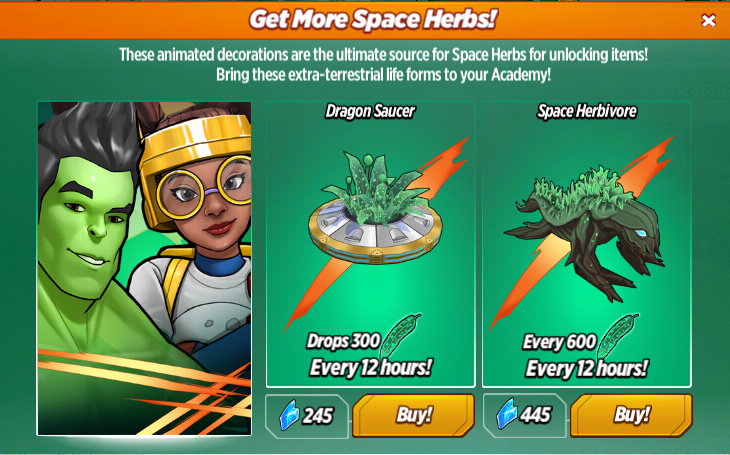 Moon Girl: Stop attacking us, and I'll make some to fit your dragony fingers. Fin Fang Foom: You would do that for me? 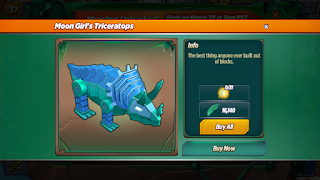 Moon Girl: I can help rescue Devil Dinosaur faster by building my own mech suit. Iron Man: Can it have a gatling cannon, and a spray missile launcher?! Moon Girl: It can have a gatling cannon, a spray missile launcher, AND a mega particle blaster. Moon Girl: That was so cool! I've always wanted to build a mech, but I never had anyone to help. Moon Girl: Are you alright? War Machine: Cool mech suit! Moon Girl: Thanks! I've always wanted one, but I never had enough giant monsters to fight. War Machine: I doubt that'll be a problem around here. What exactly does it do? War Machine: That was awesome! Moon Girl: Thanks, but I think I need to talk to Tony Stark. Moon Girl: I don't know yet. I mean, my suit is super awesome, but I can't help feeling like there's a way to make it even awesomer. War Machine: You have no idea how many times I've heard Tony say that exact same sentence. Iron Man: How was your new suit? Was it awesome? Was it super awesome? Exactly how awesome was it on an awesome scale of one to awesomest, with one being wrapping yourself in tin foil, and awesomest being me? Moon Girl: No thanks. Maybe we can just brainstorm, and tinker with things. That's usually how I come up with new inventions. 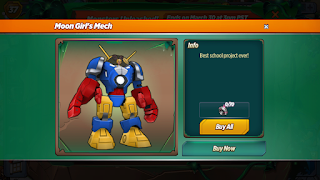 Moon Girl: I got a great idea for my mech suit! Iron Man: No! I'm just excited, so I'm screaming things! Iron Man: Ahhhhh! This is my favorite part! Iron Man: And wondering if it might explode! Iron Man: That was cool, but I didn't notice anything different. Moon Girl: It's way more efficient! I updated the systems to require half the fuel, while producing a quarter of the emissions. Moon Girl: You don't appreciate efficiency? Iron Man: Not as much as lasers. Moon Girl: Let's work on making the limbs connect to form a massive plasma cannon!